Many businesses find that in order to safely ship, store, and package their products, drums are the answer. Drums come in a variety of different materials, ranging from stainless steel to plastic to fiber, and all of them serve unique purposes that are vital to your operation. But because drums often contain substances that would be dangerous if spilled, it is important to know the proper method of dealing with them. For that, S.W. Betz is here to help with our wide selection of drum handling equipment. Read on to find out more! To transport your drums around your facility, there are different types of drum handling equipment that you might require. 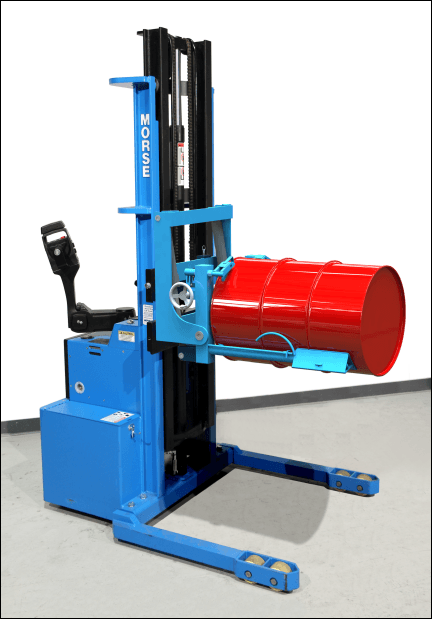 Building off of equipment you likely already have, there are options such as forklift drum attachments, which connect with your forklift for easy drum handling, or below-hook drum carriers, which are used in conjunction with your crane or hoist. There are plenty of examples of equipment that can be used independently as well; mobile drum handlers, for instance, are designed specifically so that an individual user can raise, lower, and transport a drum much more reliably than they would be able to with a cart or hand truck, which are better designed for other materials. If your drums contain multiple ingredients that need to be properly mixed before they are dispensed, then drum rollers or drum tumblers can be used to cut down on labor and time expenditures. For storage purposes, you will most likely need drum rackers and drum trucks. Every facility has its own unique set of needs, and your drum handling equipment should reflect that. Sometimes, stock options are simply not going to work for you, and when that happens S.W. Betz’s team can work to create a design that meets your exact specifications, whether that means accommodating oversized drums, finding specialized drum faucets, or anything else. Get in touch today for more information about your drum handling equipment! This entry was posted on Thursday, December 4th, 2014 at 7:57 pm. Both comments and pings are currently closed.